Because things can get messy. Got an empty tank and an empty belly? We know just the thing. In fact, we can sum it up in two words: free pizza! 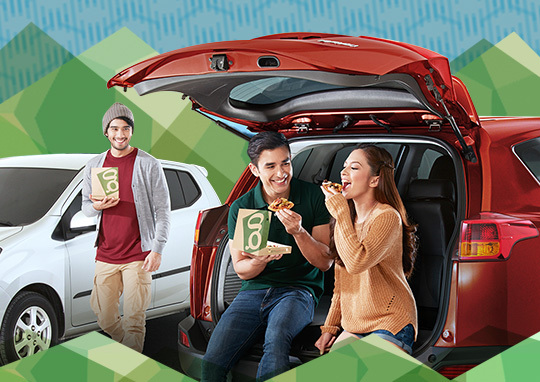 Earn one pizza stub for every P1,000 single-receipt purchase of Gold with Techron, Silver with Techron, and Diesel with Techron D at participating Caltex stations. Collect three pizza stubs, and exchange them for a Greenwich pizza coupon. Present your pizza coupon at any Greenwich store to get a solo Ultimate Overload Pizza for free! Coupon holders will also get the chance to win an all-expense paid roadtrip and appear in GMA News TV's Biyahe ni Drew. To see the complete promo mechanics, click here. Keep your focus on the road. If you must take a bite, pull over. Throw your trash in the paper or plastic bags the food came in. Better yet, have a car trash bag. Dispose of its contents properly. For quick cleanups in transit. It’s also one way to prevent your passengers from using the upholstery as a napkin. And remember: Used tissues and wipes go into the trash bag. You don’t want pests to hitch a ride. Vacuum the interiors regularly to keep your car crumb-free. Dry teabags act as odor absorbers. Place them in different corners of your car. Nobody else needs to know about the burger you ate inside. Ban these foods from your car: hot soups and drinks, ice cream (unless it’s in a cup), tacos, gummy candies and chocolates (if they melt, the stains are hard to remove), and pastries covered in powdered sugar. To lure them back, offer your friends dry cereals, banana chips, nuts, grapes, granola bars, string cheese, and trail mix. It’s the best way to enjoy your food with ketchup and toyomansi without squirting all over the seats. If the pizza is big and thin-crust, don’t let it droop. Fold the slice in half lengthwise. And we don’t mean just saying, “Kain,” and not actually offering your food. Sharing makes eating more fun. Have a slice day, everyone!